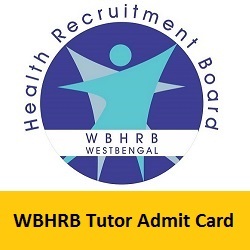 Candidates waiting for the WBHRB Tutor Admit Card 2019 can get the complete details from this page. The officials of the West Bengal Health Recruitment Board are planning to conduct the examination in the month of March 2019. But they have not yet released the West Bengal HRB Admit Card 2019. There are 402 vacant positions for the posts of tutor/ demonstration. Download the hall ticket using the link provided at the bottom of this page. The candidates competing for the tutor/ demonstration can get the information like selection process, mandatory documents, steps to download the hall ticket by referring the further sections of this page. Only the candidates who reach the eligibility criteria for WBHRB Tutor Examination 2019 will receive the admit card. Therefore, you should download the admit card either from the official website or from our page using the link provided below. Moreover, candidates should check the details present on the hall ticket after downloading it. The details on the hall ticket will be in the same fashion as mentioned below. There are some mandatory documents to be carried for the examination. There will be a verification process conducted by the examiner before the exam. During this verification process, candidates should show their identity proofs to the examiner. If the candidates do not carry the identification proofs, then they are not allowed to write the exam. Additionally, carry 2 passport size photographs along with those documents. Candidates who find it difficult to download the WBHRB Tutor Hall Ticket 2019, can refer this section. In this section, we provided the stepwise procedure to download the admit card through online. Follow these instructions to download the hall ticket. First, candidates should visit the official website of the West Bengal Health Recruitment Board i.e., wbhrb.in. Then, you will get the home page of the website displayed on the screen. After entering into the home page, you can find the modules present on it. Now, search for the desired admit card download link by referring all the modules. After finding the download link, make a click on that link. Then, a login form will get displayed on the screen. Enter the details in the required fields and click on the submit button. The details will be submitted and you will get the West Bengal HRB Admit Card 2019. Download the admit card and also, do not forget to take the hard copies of the admit card. All the best for all the aspirants appearing to WBHRB Tutor, Demonstrator Examination 2019. For any doubts regarding WBHRB Admit card 2019 details provided on this page, you can contact us at freshersnow.com.